Sir Paul ordered the dark blue sports car in 1964 on the eve of the band's world tour and had it fitted with a black leather interior, Motorola radio and its very own record player. 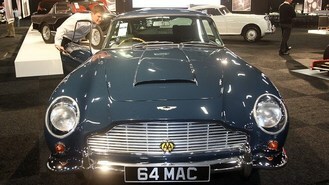 The Aston Martin sold at a hammer price of £307,500 at the event in Battersea Park, central London, a spokesman said. It was one of 93 classic cars up for auction that are expected to bring in a total of between £18 million and £20 million. Peter Wallman, of RM Auctions, said the fame of both the car and its previous owner made it a particularly special item. Speaking ahead of the auction, he said: "The Aston Martin DB5 is one of the most iconic cars in the world, driven by James Bond. And we're talking about one of the most iconic super groups of the 1960s. We've sold a couple of cars owned by Steve McQueen which have sold for eight, nine, 10 times what they would be worth if they were just regular cars." Sir Paul bought the car weeks after The Beatles' appearance on The Ed Sullivan Show in America and the completion of filming A Hard Day's Night. The Aston Martin DB5 was delivered to the musician's accountants when it left the factory in July 1964 and became a regular feature of Sir Paul's 1960s lifestyle, according to contemporary records. A profile of the singer in Time magazine on 22 September 1967 noted: "Bachelor Paul, 25 (his favorite (sic) 'bird' is 21-year old actress Jane Asher), is a movie addict, loves 'the look of London', and tools around town in a spiffy blue Aston Martin DB5".